When it comes to teaching about the cultures and histories of the world, what teacher wouldn’t want the Magic School Bus Ms. Frizzle used to drive her third grader students around time and space? While its unlikely that schools will be adding a time/space traveling school bus to their school budget, not to mention the mountain of forms you’d need to bring your students to China in 221 B.C to view the creation of the Terra Cotta soldiers, when teaching about Asia teachers continue to rely on primary sources to allow their students to learn about people, events and everyday life in other cultures. Primary sources are amazing teaching tools, as they allow students to be detectives in the classroom, shifting through evidence to reach conclusions, developing critical thinking and deductive reasoning skills that will be useful throughout their lives. 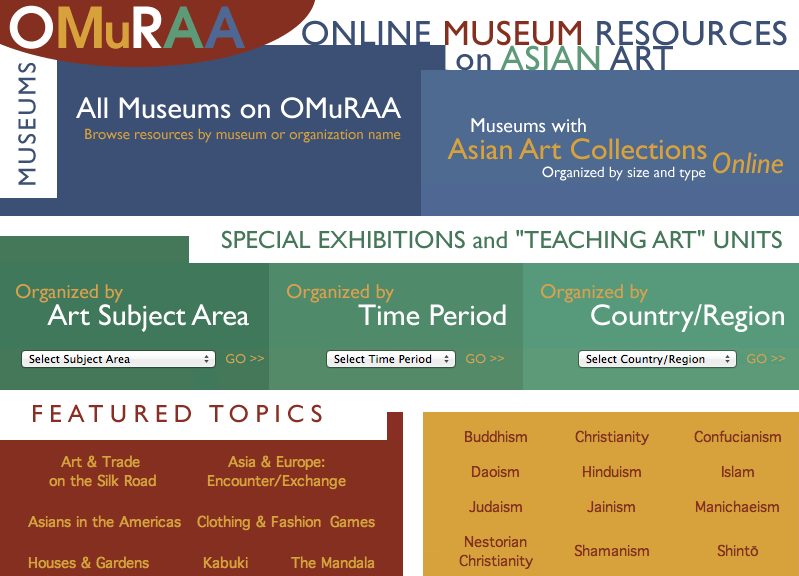 The Asian Studies Outreach Program resource library has dozens of primary source kits to help students learn about different cultures, but as more and more schools more one-to-one with learning devices, programs such as ours are realizing that the best way to help teachers teach about Asia is to create wondrous online worlds for students to explore cultures digitally. The National Consortium for Teaching about Asia (NCTA), a collaboration of the East Asian Studies programs at seven national institutions, has begun to focus more attention by placing resources for teaching about Asia online in order to encourage and facilitate teaching and learning about East Asia in elementary and secondary schools nationwide. At the NCTA site at the University of Colorado at Boulder, the Imagining Japanese History is an online curriculum designed to enhance students' visual literacy skills, historical thinking skills, and knowledge of Japanese history from the Heian period to the late 20th century. At Columbia University, the NCTA Asia for Educators website includes an online museum resource on Asian art. A multiyear initiative, this online museum resource allows teachers and students to search by art subject area, time period or country/region. In order to provide educators with the opportunity to increase their knowledge base on Asia, the Five College Center for East Asian Studies at Smith College has developed a series of free webinars in conjunction with leading East Asian experts on topics that range from “Chinese Characters and the Stories They Tell”, to “Korean Reunification” to “Japan’s Textbook Controversy”. As more webinars are developed, older webinars are archived but can be accessed upon request. Teachers interested in knowing more about online resources are encouraged to attend the upcoming National Consortium for Teaching about Asia seminar series at the University of Vermont (NCTA in Vermont), a free five-part seminar series designed to provide K-12 educators of the humanities with a rewarding professional experience. The seminar series combines face-to-face lectures with experts on East Asia with access to digital resources, including a one-year subscription to Education about Asia. The NCTA in Vermont seminar series is now accepting applications. For information on the syllabus and graduate credits, please contact Jacqueline Drouin at the Asian Studies Outreach Program.